Museveni knows how his NRM messed up the country's economy given the developments to the election which led to his getting back to the office of President. If only the NRM had been a principled lot; they would not have been that ignorant in economics to get the economy to the state it is in. For this, Museveni should apologise as traders find it harder day by day to adjust so that they don't keep losing money as it continues to depreciate. Being the President does not mean he does not stand up to the messes by his party. President Yoweri Museveni has warned Kampala City Traders Association (KACITA) leaders against using strikes and violence, saying that he will not succumb to such pressure. Museveni cautioned the Kampala business leaders during a meeting held at State House Nakasero on Wednesday. “These strikes and confusion will harm our economy. 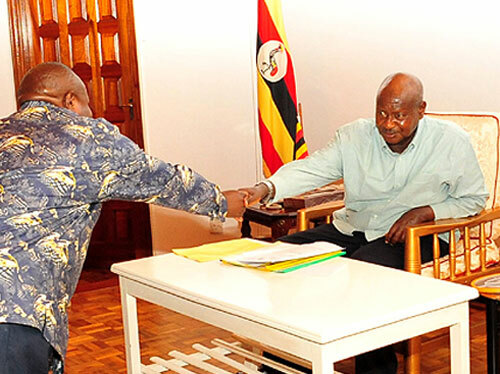 There is no reason for resorting to strikes when we can discuss these issues amicably,” Museveni said. The president noted that the problems that the traders attributed to the strike will be solved harmoniously. The KACITA delegation was led by their patron and Kampala tycoon Godfrey Kirumira who told the President that their members were eagerly waiting to know the outcome of their meeting. Museveni pointed out that Uganda’s economy was performing very well as opposed to earlier pessimism. The President will have another meeting today (Thursday) with the same group joined by managers of commercial banks which have raised interest rates, governor Bank of Uganda, Emmanuel Mutebile as well as the minister of trade and industry, Mrs. Amelia Kyambadde and the minister of state for finance (General Duties), Mr. Fred Omach. Museveni said that he was unable to meet the whole group because of his new practice of holding meetings only during the day. He reiterated that the traders should not close shops because all matters can be discussed and argued that even the banks that are accused of causing the strike belong to Ugandans. “Any bank based in Uganda does not belong to its owners, but to Uganda,” the president remarked. On Wednesday, the streets of Kampala were a picture of an absence of the usual hustle and bustle with some shops in the central business district (CDB) closed following a decision by traders to launch a three-day sit-down strike protesting commercial banks' refusal to lower interest rates. Shops along Luwum, William, Ben Kiwawuka and Johnson streets remained closed. KACITA announced a three-day closure of shops until government prevailed over matter. The effects of the strike rippled across the public transport system. Most taxis using the Kampala Road/Jinja Road were either half-filled or close to empty as the tauts could hardly find the usually large groups of people waiting at the respective stage points.